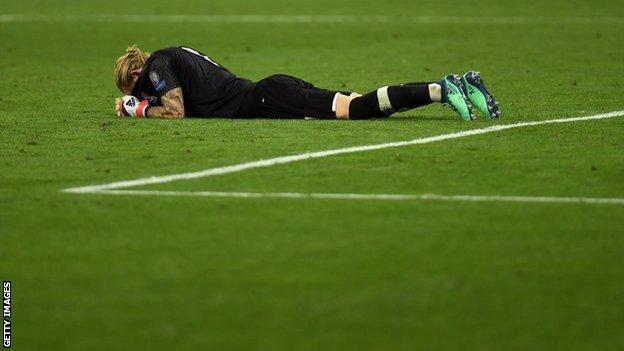 Karius was left dejected in his penalty area after Liverpool's 3-1 defeat in the Champions League finalI feel sorry for Loris Karius, because he will be absolutely heartbroken after his nightmare display in the Champions League final - but I don't see any way back for him at Liverpool now.Karius had an awful night and it was horrible to watch the Reds goalkeeper completely alone in his penalty area at the end of the game. The Real Madrid players were the first to console him, followed by a member of the Liverpool coaching staff.I know from experience that when you lose a big game as a player, you sometimes need a few minutes to collect your thoughts, and those are times you are really just thinking about yourself. We have all made errors that have cost goals and although Karius's first one, when he threw the ball at Karim Benzema, was a massive howler, it was also a little bit of a fluke.However, his second mistake, when he fumbled Gareth Bale's shot over the line, was something I don't think he can recover from.As Jurgen Klopp said afterwards, I don't think he would have done it if he had not made the first error, because he clearly wasn't over that despite Liverpool equalising soon afterwards.I just wonder if he lacked a little bit of concentration because he knew he had messed up massively for Real's first goal, and it would not be the first time that had happened.He got away with something similar in the first leg of Liverpool's semi-final win over Roma, when Aleksandar Kolarov's shot slipped through his grasp, but the ball hit the bar. On Saturday, he was not so lucky.It is not just focus that Karius lacks because technique-wise, he is flawed too.One of the things I have noticed with him is that he parries everything that comes at him, which is fine, but he sends the ball straight back to where it has come from instead of to the side of the goal.It almost cost Liverpool a goal in the first half against Real when, in making a great save to deny Cristiano Ronaldo, he pushed the ball out to Benzema, who put the ball in the net but was offside. The fact they were beaten by Real, and the way it happened, made for a disappointing end to this campaign, but Liverpool still had a fabulous run to reach the final and won a lot of friends for the football they played along the way.It is not just their results that have been impressive, it is the way they beat teams by scoring so many goals with some truly memorable performances.Aside from the Karius errors, I thought they did OK against Real too.Losing Mohamed Salah to injury after 30 minutes was a big blow and they effectively had to make two changes when he went off because Adam Lallana played on the left when he came on, and Sadio Mane took Salah's role on the right.Liverpool were unbalanced at first but they adjusted and they also showed the character they have in that team when they got back to 1-1 so soon after falling behind. What beat them was Gareth Bale's wonder goal because that really knocked the stuffing out of them. The third goal really just added insult to injury.I said "uh-oh" on BBC Radio 5 live when Bale came on because I know what he is capable of, but I did not expect the ball to be in the net 122 seconds later.It was an absolutely sensational finish from the Wales forward and in the hundreds of games I have played in or been at, I don't think I have seen a better goal live than that.It is amazing to think he cannot get in that team because that was such a crucial time to do something very special in such a massive fixture. How can Reds match Real? Before the game, I said I felt that Liverpool had to score first to win and they had their chances to do that in the first half.The thing I feared was the way Real are able to manage the game when they get in front, and give you very little chance to build any rhythm.They are very good at disrupting the flow of the game by tumbling around or going to surround the referee for the most innocuous of fouls to demand a yellow card - all that kind of stuff.I don't like it, and I don't necessarily want Liverpool to do it, but that is what you are up against when you play them - you have to beat that, as well as the football side of things. Real are not the best team in Europe but there is a reason they have been champions for three years running and, to match them, Liverpool have to be a little bit stronger and cuter.It is the next hurdle that Klopp's side have to overcome - they play great football, which is breathtaking and refreshing, but they have to get better at getting over the line in tight matches.I still think they are heading in the right direction, though. As well as a new keeper, they clearly need to improve their strength in depth, but there are still plenty of reasons to be positive, and this defeat does not change that.Mark Lawrenson was speaking to BBC Sport's Chris Bevan.